CRAVE American Kitchen & Sushi is located in the heart of the Twin Cities’ hottest destination. Whether you’re taking a break from shopping, grabbing a bite before a Summer Blockbuster, or celebrating a special occasion, CRAVE is the perfect option for you. Enjoy the sunshine in our Sunroom or warm up by the fireplace, celebrate in style in one of our Private Dining Rooms, or take a seat at our Grand Sushi Bar to watch as your meal is prepared before your eyes. 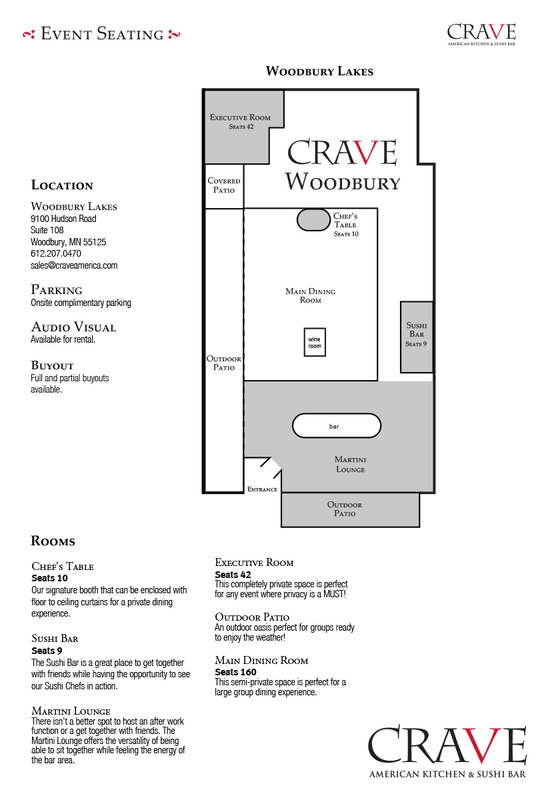 Book CRAVE – Woodbury Lakes For Your Event Today!